A couple of updates on my book, Virtual Law: Navigating the Legal Landscape of Virtual Worlds. First, there are two early reviews of Virtual Law that I want to share with readers. The book is timely, circumspect, well written and grounded where it is supposed to be while provocative in areas that it needs to be. 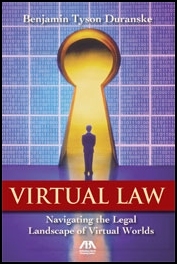 The author’s experience in virtual world use and commentary shines as he teases out the importance of law to virtual worlds, and vice versa. Benjamin Duranske makes virtual law in concept and practice very tangible and understandable. This book is not only a book introducing Virtual Law — it is a book of reference for lawyers, virtual world users and virtual world owners alike. Dr. Edward Castronova of Indiana University, a well-known commentator on virtual worlds and games, occasional expert witness on the economics of 3D networked environments, and creator of Arden: The World of William Shakespeare, also offered some very nice comments. Ben Duranske hits the mark again and again with this clear, straightforward overview of legal issues in virtual worlds. All of the main arguments are here, in a single source, allowing the reader to balance the claims of contract law against those of property law in regulating the toughness of the magic circle. Woven together, these arguments constitute a desperately-needed consensus, one that recognizes the inevitable influence of real-world law on the future of this critical medium, but also its limits. Dr. Castronova’s comments are particularly appreciated in light of the fact that I owe him and well-known game designer Raph Koster a correction. As you would expect, Virtual Law refers to the works of dozens of scholars, writers, and game designers. In fact, it is the kind of book that is only possible to write from the high vantage point offered by a perch on the shoulders of giants like Castronova, Koster, and others. Unfortunately, one key passage in the book misattributes Edward Castronova’s theory of “interration” to Raph Koster. The theory is correctly attributed in other places in the book, but somehow, this reference slipped by in spite of dozens of editing passes. Dr. Castronova is well known in legal and gaming circles for the theory of interration, and I actually have a dog-eared copy of the paper where he proposes the theory sitting on my desk right now. My most sincere apologies to both gentlemen for the incorrect attribution; it will be corrected in the next print run. Because the passage is an important one, and because I am a big fan of Castronova’s theory, I am running a corrected version below. Consider it a sneak preview of one of the big-picture arguments set forth in Virtual Law. [Professor Joshua] Fairfield’s theory [advocating the recognition of virtual property], while representing an obvious change in the way we would view some current games and virtual worlds, makes a great deal of sense. We know that property law, as it stands, does not recognize the $1.8 billion industry, but as the industry increases in size, pressure for change inevitably increases as well. Clarification is appealing not only to scholars, but to attorneys, executives, and game designers working in this space as well, who would very much like to see some general understanding regarding the status of virtual property emerge. Many, myself included, believe this is inevitable, and think that Fairfield’s definition will prevail. However – and this is a very big however – the existence of virtual property as described in Fairfield’s definition will only be widely accepted by the game design community, and thus implemented in the rules, Terms of Service, and End User License Agreements of virtual worlds and games if it is offered in conjunction with something like Edward Castronova’s theory of interration. Any effort to legislate the existence of virtual property will – and should – be met by fierce resistance from the game design and user communities on the grounds that such an effort would undermine play spaces as play spaces unless the measure is accompanied by a mechanism that allows games and virtual worlds that wish to remain play spaces, clear of the obligations that the notion of virtual property creates, to do so. People should be able to play games, trade goods, and interact socially without real money entering into the transactions uninvited. Forced commodification would ruin much of what is good about play spaces by turning every three-dimensional social and play space into a casino-mall-brothel. It is a reasonable assumption that if one of these theories is adopted as law, the other will be as well. That is, if a new class of property known as “virtual property” is acknowledged and protected from outright grabs via contract law, along with that will come some mechanism whereby game and virtual world providers can create environments that exist without being concerned with the real-world value of every digital sword, hat, and paperclip that is represented in the world. If that assumption holds – that Fairfield’s hypothesis will only be adopted in conjunction with something along the lines of Castronova’s theory of interration – a company that does choose to avail itself of interration will be free of the restrictions of “virtual property” law, and thus can manipulate it’s economy at will, delete items and accounts on a whim, introduce new features that grossly devalue current property, and generally, treat the world as a true game or environment for social experimentation without fear of lawsuits. We can assume that many, if not most, game companies will take this route, preserving via “interration” (or a process like it) what they are finding they have a very difficult time preserving through contract. Many players will presumably seek out these worlds and games, because they can be relatively confident that their individual heroic journey (in games) or socio-economic experiments and interaction (in social virtual worlds) will not be compromised by the presence of a black market trade in the goods and abilities that they are struggling to accumulate (in games), or the restrictions of real-life law (in social virtual worlds). There will not, of course, be the possibility of making real money in these spaces, but just as the vast majority of people choose not to play Monopoly for real money, presumably a large percentage of the players of online games and participants in social virtual worlds will choose to participate for fun. Their fun will be enhanced by the security of a level playing field and the absence of restrictive legal oversight. On the other hand, a company that chooses to act as a full participant in the notion of virtual property will gain the not insignificant benefits of a new set of potential revenue streams, a more “real” economy with higher stakes for players, and the opportunity to serve a presumably older, more professional, more profitable user base. A company that chooses this path will, however, have to deal with certain ramifications of that decision which, in the absence of such a rule, companies who are flirting with the notion of virtual property have [so far] been able to sweep under the rug with broadly-phrased contract provisions.